MIG/MAG is a process where a consumable solid wire is fed through a conduit and a torch up to the welding arc, where it melts and is transferred as droplets to form the weld metal. The arc and the molten pool are protected by a shielding gas, usually argon, CO2 or a mixture of these. 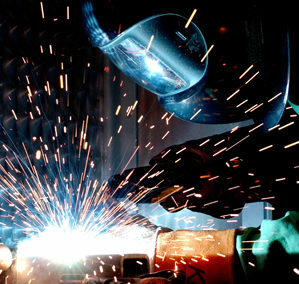 Choice of gas depends upon the material to be welded. The process is suitable for most metallic materials, and is extensively used for stainless steel and aluminium, in addition to ordinary carbon steel. It works in all positions, and covers the whole range from thin plate to heavy steel constructions. Tubular, flux cored wires are also very much used, although not for aluminium. MIG/MAG is basically a semi-automatic process, where the torch is moved and guided by hand. But it is also very well suited for full mechanization, with the torch fixed over a rotating workpiece or mounted on a travelling carriage following the joint by means of a suitable guiding mechanism. Welmax design and deliver complete mechanized production units based on MIG/MAG.